Clinical trials show guselkumab to be better than current medicines. FOR MANY YEARS, sufferers of psoriasis have been told it is ‘just something they have to live with’. But as the immune-mediated disease causes physical discomfort from itchy, dry and red skin, as well as contributing to other problems including depression, heart disease and diabetes, the medical world is looking for better ways to treat it. Good news emerged late last week in the form of results from a clinical trial published in the New England Journal of Medicine. The phase II trial, led by Northwestern Medicine, found that a new drug called guselkumab is more effective that the current stand of care for the chronic skin condition. According to the lead researcher, Professor Kenneth Gordon, those with the condition may not see a daily impact in the future. “For patients, the concept that psoriasis is ‘just something you live with’ is no longer appropriate,” he said. The possibility of getting almost all patients nearly clear and able to live their lives without the burden of this disease impacting them every day is getting close to reality. Currently, about 3% of the world’s population suffers with psoriasis. About half of whom get no treatment at all. The trial for guselkumab involved 293 patients with moderate-to-severe psoriasis, meaning it covers more than 10% of their bodies. The men and women received either varying doses of the new drug guselkumab, the current treatment adalimumab or a placebo over 52 weeks. At weeks 16 and 40, a “significantly higher” proportion of patients using guselkumab were clear of psoriasis or it was “minimal”. After 40 weeks, 81% of patients taking a 200mg dose of guselkumab had a score of 0 (no psoriasis) or 1 (minimal psoriasis), compared to 49% of patients who took adalimumab. 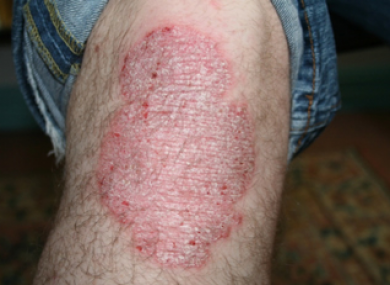 The new drug works by blocking a protein specifically implicated in psoriasis, called interluekin 23. Older drugs rely on affecting the immune process more generally. “Building on multiple layers of clinical and basic research, we are changing our understanding of how psoriasis works,” Dr Gordon said. By doing so, we are able to build new treatments that specifically target the immunological processes of psoriasis while leaving even more of the normal immune system intact. Phase III of the trial has already started to test the safety and efficacy of the drug. Email “Do you suffer with psoriasis? A new drug treatment could offer you great news”. Feedback on “Do you suffer with psoriasis? A new drug treatment could offer you great news”.